This entry was posted in Blog, Production Updates on June 11, 2013 by '63 Boycott. On Friday, ’63 Boycott had its first day of production in 2013. 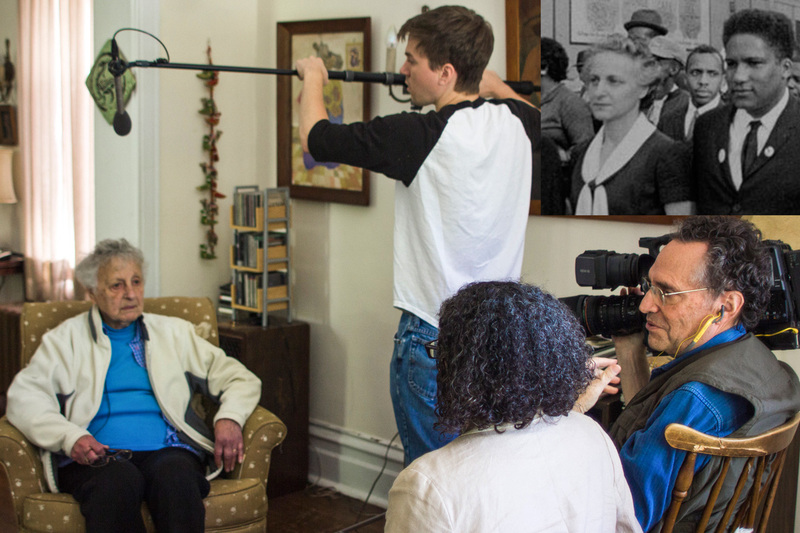 Almost 50 years after Freedom Day, we were able to connect with Sylvia Fischer, pictured above, a former 3rd grade teacher at Shoesmith School and an organizer of the 1963 Boycott. Sylvia appears in our footage at the head of the downtown march, linking arms with Civil Rights legends James Foreman, Lawrence Landry, and Lillian Gregory. We first met her at an event organized by the Civil Rights Opera, where she picked herself out of one of our film stills. Watch a short documentary of that event created by filmmaker and former Kartemquin intern Dain Evans. In her interview, Sylvia reflected on over 50 years of experience with CPS, the tension between the mayor’s office and protestors in 1963, and the importance of teachers in education. Now retired, Sylvia lives in Hyde Park, where she is frequently visited by adoring former students who remember making soup with her in 3rd grade. Less than fifteen minutes away, on the 6500 block of South Vernon Ave, lives Ralph Davis, a former student of Waller High School, now Lincoln Park High. On October 22, 1963, this outspoken 14-year-old was interviewed by our director Gordon Quinn – see him at in our short preview of ’63 Boycott. Ralph was located thanks to the efforts of ’63 Boycott outreach coordinator Rachel Dickson. He has lived quite a life since the Boycott – after going to school at Columbia College and working as a professional photographer, he moved on to corporate America and finally settled in real estate. A real live wire at age 66, Ralph is married to a former Chicago Public Schools teacher and has several grandchildren and great-grandchildren. He glows with pride when he talks about his garden and raises a flock of cockatiels in his back porch. 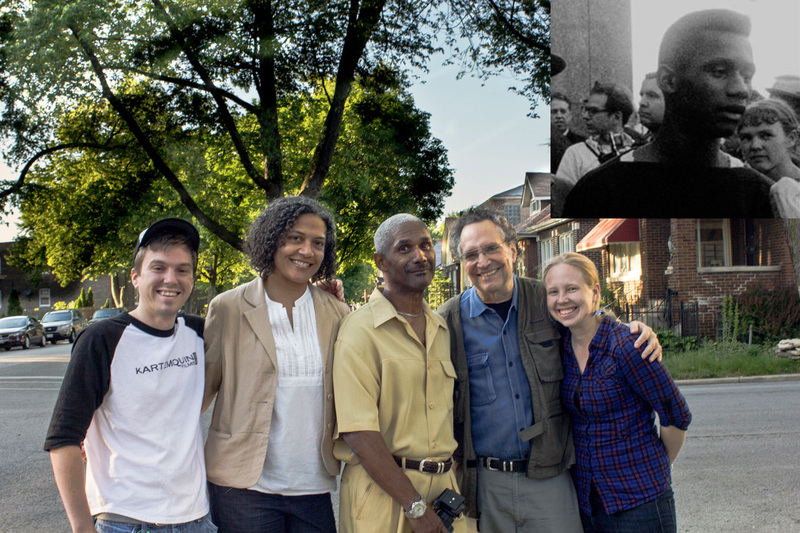 The ’63 Boycott production team features Trayce Matthews of the University of Chicago’s Center for Race, Politics and Culture conducting interviews, production associate John Fecile on sound, Rachel Dickson assisting with production, and, of course, our fearless leader Gordon Quinn on camera. Ralph recognized Gordon as he climbed the stairs to his home; our original cameraman from 1963 hasn’t changed his style much since then. These amazing discoveries could not happen without incredible word-of-mouth this project is generating. We will be using Ralph and Sylvia’s interviews as part of a demo of our work to seek further funding and will publish excerpts on this blog. Stay tuned for more production updates this summer.